Last week’s 1-0 win at Brighton was no thing of beauty, but it felt just as satisfying as the 5-1 romp in the same fixture the previous season given Liverpool’s need to overcome their early January blip. Manchester City unsurprisingly maintained the four-point gap on Monday night, which made Liverpool’s triumph on the south coast last Saturday even more crucial. This weekend, the Reds again have the chance to temporarily go seven points clear at the summit of the Premier League, with their nearest rivals not playing until tomorrow. Jurgen Klopp’s side will be expected to get another three points on board at home to Crystal Palace, especially with such an impressive record at Anfield this season, but the German won’t need reminding of how difficult the Eagles can be when playing away to a top six outfit. 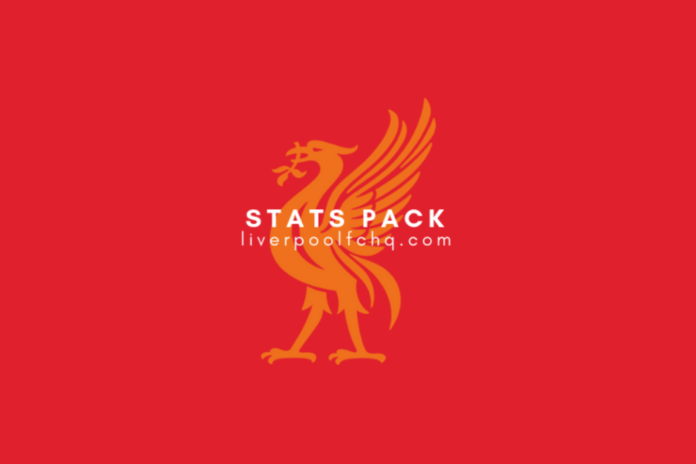 It was just under a month ago that Roy Hodgson’s side provided Liverpool with unexpected pre-Christmas cheer after their stunning win away to Manchester City and, as our statistical analysis shows, they won’t be unduly inhibited by a trip to Anfield given their recent record at the venue. The win at Brighton got Liverpool back on course after defeat to Manchester City ended an eight-game winning sequence in the Premier League. This Saturday, the Reds go for their seventh straight home win in the league, and ninth in all competitions, with Pep Guardiola’s team the last to deny Liverpool victory at Anfield back in October. Of the three goals Klopp’s side have conceded at home in the league, two have come in the last month, with Jesse Lingard and Ainsley Maitland-Niles depriving Alisson of clean sheets in the wins over Manchester United and Arsenal respectively. Half of Crystal Palace’s Premier League wins this season have come in their last six games, with Leicester, Manchester City and Wolves all suffering defeat against the Eagles. In fact, four of their six league wins have come away from Selhurst Park, including unexpected triumphs at the Etihad Stadium and Molineux, coincidentally the venues of Liverpool’s two defeats earlier in the month. Palace have scored as many league goals (10) in their last eight games as they managed in the previous 14, indicating that they have found the scoring touch of late. Here’s a stat that will give Crystal Palace encouragement: seven of the last eight Premier League meetings between these two have ended in an away win, the sequence broken only by a Liverpool victory in this fixture last season (more on that below). Prior to that, the Eagles had won on their last three visits to Anfield and they continue to have the distinction of inflicting Liverpool’s most recent Premier League home defeat, 1-2 in April 2017 when Christian Benteke scored twice for the visitors against his former club. In their 19 Premier League clashes, only seven have resulted in a home win, compared to nine away wins. 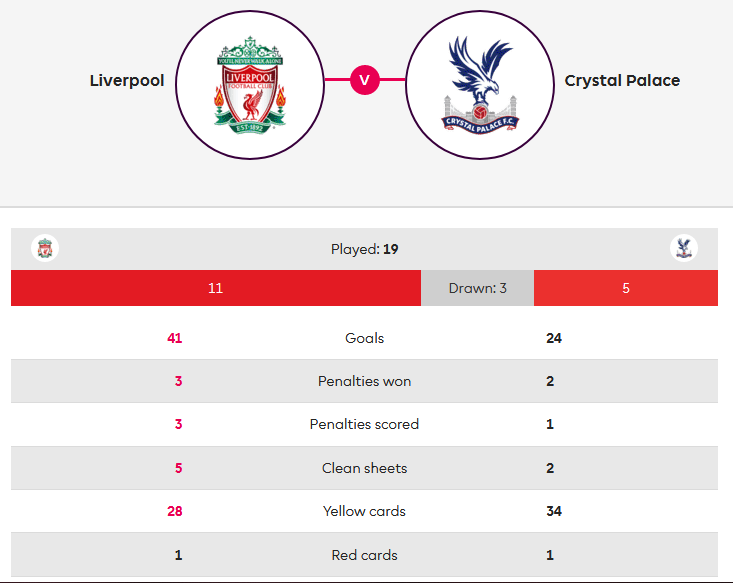 Liverpool are going for their fourth consecutive victory over the Eagles and, should they pull it off, it will be just the third time in 10 Premier League seasons that they have done the double on Palace, having managed it only once prior to 2017/18. Palace fans have some famous Anfield victories to recall, though – they spoiled Steven Gerrard’s last match at the venue towards the end of the 2014/15 season and also handed Klopp his first defeat as Liverpool manager in the same fixture six months later. 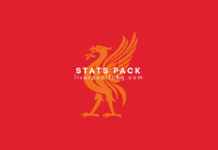 Liverpool’s first home match of last season was not one they would have been eagerly anticipating, given that Crystal Palace had won at Anfield on their three most recent visits. 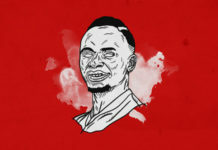 The Reds’ need for victory was amplified by their failure to beat Watford the previous week, while the Eagles had been stunned 0-3 at home by Premier League debutants Huddersfield. Speaking of debuts, it was a first appearance in Liverpool red for Andrew Robertson, who this week signed a new five-year contract with the Merseysiders. Benteke, whose brace had given Palace victory in this fixture four months previously, contrived to miss from eight yards out during a lacklustre first half. Joel Matip had the home side’s best chance before, in the 73rd minute, Sadio Mane finally quelled the growing nerves of the Kop with a goal that, like this match, was no classic. The Reds saw out the closing minutes for a scrappy win – amazingly, while they would win 30 more games during 2017/18, this would be their only 1-0 triumph of the entire season. Of the 20 Premier League goals scored by Crystal Palace this season, only four have come from strikers: we’ll count Wilfried Zaha’s three in that bracket seeing that the nominal winger has predominantly played as a front man this season. The only other Palace striker to score in the league is Jordan Ayew, who netted his first Eagles goal in the 2-0 win at Wolves earlier this month. Eleven of their 20 goals have come from midfield and six of those belong to Luka Milivojevic, with five of that half-dozen coming from the penalty spot. The Serbia international has scored four times since the start of December, although he did miss a penalty on Merseyside earlier this season when the Eagles lost at Everton in October. Their other goalscoring midfielders in 2018/19 are Andros Townsend (three) and James McArthur (two). Next articleKi-Jana Hoever: Is he really the next Van Dijk?